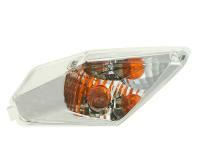 Replacement rear left indicators for Derbi GP1 50 (2005), GP1 Open 50 (2006-2009), GP1 Race 50 (2005-2007), GP1 125 (2006), GP1 Low Seat 125 / 250 (2007-2008), GP1 250 (2006-2007) scooters. 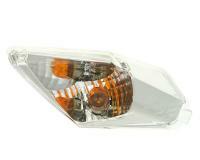 The turn signal corresponds in shape and dimension to the original part. Replaces OEM-No. : 00G01700541.